Meniere’s disease (MD) is an inner ear syndrome defined by three major symptoms: episodic vertigo, tinnitus and sensorineural hearing loss involving low and medium frequencies. The disorder is explained by the accumulation of endolymph with increased pressure in the cochlear duct (endolymphatic hydrops), which damages the organ of Corti. The condition shows a great clinical heterogeneity with large differences in response to therapy and clinical variants with different mechanisms have been proposed such as autoimmunity or autoinflammation. The majority of cases are considered sporadic, although familial aggregation has been recognized and few genes have been described in autosomal dominant families. Detailed phenotyping and cluster analyses have found several clinical predictors for different subgroups of patients, which may indicate different mechanisms, including genetic and immune factors (Flook and Lopez-Escamez, 2018, doi: 10.1007/s40136-018-0182-8). So far, two mechanisms have been involved in MD: 1) a pro-inflammatory immune response mediated by IL-1β, TNFα and IL-6, suggesting an autoinflammatory process (Frejo et al., 2018, doi: 10.1038/s41598-018-23911-4), and 2) an endophenotype found in 18% of patients with autoimmune MD defined by an NFκB-mediated inflammation in the carriers of the single nucleotide variant rs4947296 (Frejo et al., 2017, doi: 10.3389/fimmu.2017.01739). to define endophenotypes according to specific mechanisms of the disease. 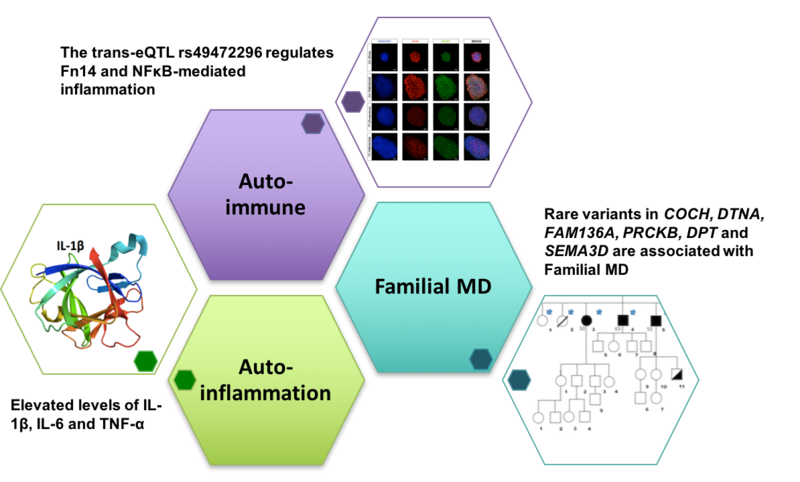 The starting point of the MDmap is the autoimmune module which is based on the gene expression datasets obtained for peripheral blood mononuclear cells (PBMC) from patients with MD. The MDmap development is led by the Centre for Genomics and Oncology Genyo in close collaboration with the LCSB Parkinson’s Disease Map team. The MINERVA platform is employed for online visualisation and exploration. The list of the Editorial Panel members is being confirmed. We aim at bringing together top experts in the field of the Meniere’s disease research. The MDmap is a project initiated as part of MD-CONNECT project funded by the FNR INTER Mobility and the Andalusian Health Department.